Chicken recipes are something which we crave for more. This is because chicken recipes are is most versatile recipes which can be cooked in different flavors. When we are in a hurry we always go for Chicken drumstick recipes or chicken thighs recipes instead of whole chicken recipes as they are quick and perfect for a quick lunch or dinner meal. If you are looking for a simple chicken recipe to serve along with salads, rice or pasta then here you go. 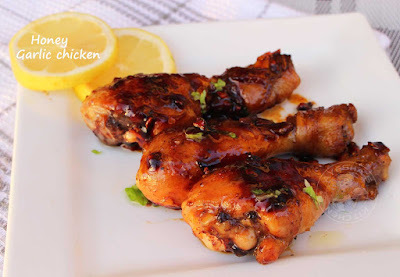 Here am going to share a sweet and savory chicken recipe with chicken legs or chicken drumsticks. 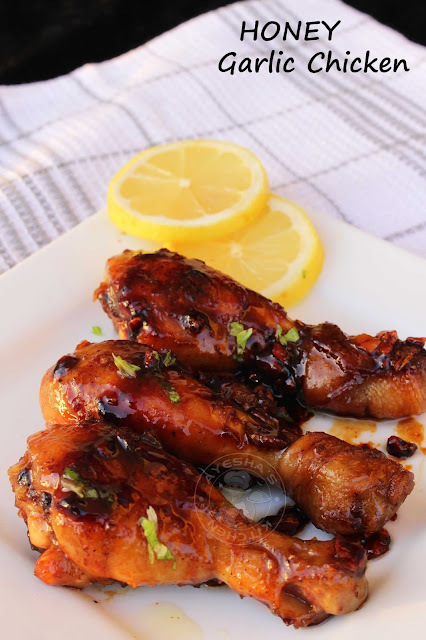 This juicy and flavorful honey garlic chicken is ready in less than 20 minutes. A simple and less messy chicken dish. Honey chicken is my favorite all the time. This sticky easy honey garlic chicken is tender, juicy with full of flavors. Here seasoned chicken legs are tossed until done and then coated with honey garlic sauce which makes this dish yummy. Hope you all will try this honey chicken recipe for sure. So let's move on to the recipe showing how to make honey garlic chicken with the chicken drumstick. Heat a non-stick pan with 1 tbsp of olive oil. Make the flame to medium low and toss the chicken on both sides until golden and cooked through. Now add honey, water, soy sauce and vinegar together. Then make the flame to medium and cook until the sauce thickens slightly (3 minutes). Do not cook for long. When done, coat the chicken well in this sauce. Garnish with parsley leaves or sesame seeds. Serve hot along with veggies and rice.